The Peggy was a very popular name for a vessel, it is impossible to identify the ship involved without further information. The print of the two men of war (but without the two ships in the distance) was also used on another mug in conjunction with a print of Admiral Boscawen. This classical scene is one of a number used at Worcester that are generally agreed to be the work of Hancock. His inspiration seems to have been engravings by JS Muller or F Vivares, after Pannini's paintings of ruins in Rome. Hancock generally copied fragments of different engravings, such as the Borghese vase seen in this design, and incorporated them into his overall design. Other elements, such as the girl admiring the statue of the discus thrower, may be his own invention. 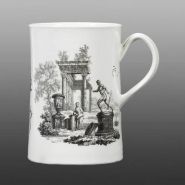 The print on the other side of the mug uses an engraving by Muller after Pannini as its source. The Temple of Peace with its statue is selected, together with Constantine's column, to form the basis of the Worcester design. This engraving by Johann Sebastian Muller after Giovanni Paolo Pannini was published in 1753. The Worcester print follows the left hand side of the engraving but with the replacement of the mausoleum and St Paul's gate, which appear between the Temple of Peace and Constantine's column, by a tree. 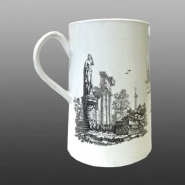 This Worcester mug is decorated with a rare shipping print between two prints of classical scenery. Below the shipping print is a scroll with a hand-painted inscription "SUCCESS TO Ye PEGGY". This was clearly a special commission but, as The Peggy was a very popular name for a vessel, it is impossible to identify the ship involved without further information. The print of the two men of war (but without the two ships in the distance) was also used on another mug in conjunction with a print of Admiral Boscawen.